Emory and the 19 other schools chosen will each receive $75,000 over the next three years to advance the AMA's work aimed at transforming undergraduate medical education to better align with the 21st century health care system. The American Medical Association (AMA) recently announced that Emory University is among 20 medical schools selected to join its Accelerating Change in Medical Education Consortium. The schools will enhance the innovative work underway to create the medical school of the future and quickly spread these innovations to additional medical schools throughout the U.S.
Emory and the 19 other schools chosen will each receive $75,000 over the next three years to advance the AMA's work aimed at transforming undergraduate medical education to better align with the 21st century health care system. They will build upon projects that were created when the AMA launched its Accelerating Change in Medical Education initiative in 2013 and provided $11 million in grants to 11 medical schools. The schools share best practices and ideas for developing innovative curricula that can ultimately be implemented in medical schools across the country. With the added schools, the now 31-school consortium of the nation's leading medical schools will ultimately impact thousands of medical students across the nation currently being trained to care for patients in the rapidly changing health care environment. They will support training for an estimated 18,000 medical students who will one day care for 31 million patients each year. "Our goal throughout this initiative has been to spread the robust work being done by our consortium to accelerate systemic change throughout medical education," says James L. Madara, MD, chief executive officer, AMA. "By tripling the number of schools participating in this effort, we know that we will be able to more quickly disseminate the Consortium schools' innovative curriculum models to even more schools—leading to the type of seismic shift that the medical education system needs so that future physicians can better care for their patients." Through a competitive grant process, the schools were selected from among 170 eligible U.S. medical schools by a national advisory panel, which sought proposals that would significantly redesign medical education. Emory proposes a comprehensive curriculum in quality improvement and patient safety across the medical education continuum that begins in the first year of medical school and extends all the way through graduate medical education, continuing medical education and faculty development. Along the way, there is an emphasis on training and working in interprofessional teams to deliver high quality, safe medical care. 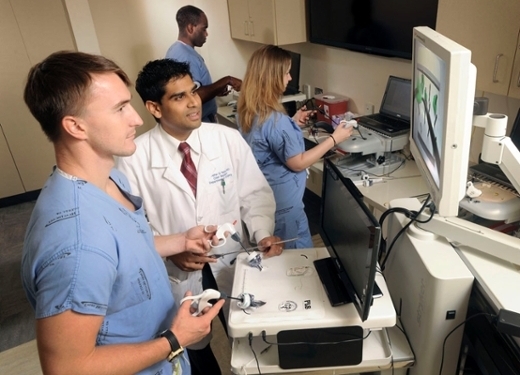 The Emory project emphasizes building real world skills with defined milestones and measurable outcomes and involves a unique collaboration with Emory's partner health systems: Grady, Children's Healthcare of Atlanta, the Atlanta Veterans Affairs Medical Center and Emory Healthcare. "Over the last eight years, the School of Medicine has been working to develop an innovative curriculum in patient safety and quality improvement," says Nathan Spell, MD, associate professor of medicine (general medicine), Emory University School of Medicine and chief quality officer, Emory University Hospital. "This opportunity from the AMA helps us shape a cohesive vision and call on the tremendous talent we have in this field coordinating across multiple settings with our educational and health system partners to ensure all members of the medical community have a shared understanding and approach to quality improvement and patient safety." "We are honored that the AMA has recognized our strength and vision in this area and our overall commitment to being a 21st-century model for training the very best physicians," adds Spell, a co-principal investigator of the AMA grant. J. William Eley, MD, MPH, executive associate dean for medical education and student affairs, Emory University School of Medicine, is the principal investigator of the AMA grant. The list of selected schools, along with short descriptions of each school's project, can be found online at www.changemeded.org.